The goal of Left 4 Dead is simple: survive. You are one of the lucky few survivors of a new and highly virulent strain of the rabies virus that has spread throughout the human population, turning the unfortunate masses into rabid, bloodthirsty zombies. You must work together as a team if you want to have any chance of making it out alive. For those of you who don't already know, Left 4 Dead is a first person multiplayer co-op survival horror shooter built on the Source engine. 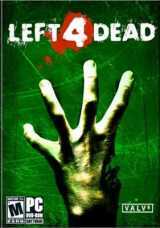 Left 4 Dead pits 4 human Survivors against 4 human or AI controlled boss infected, which with the help of dozens upon dozens of the AI-controlled infected horde, try their hardest to make the Survivors fail. The four campaigns that will be released at launch are all of the "Survive and Escape" variety, where the group of survivors will have to battle their way through large, varying environments filled with boss infected and zombie hordes in the goal of escaping.